Ad Exposure In Puerto Rico. 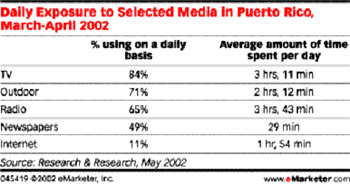 Latin American market research firm Research & Research surveyed over 5,000 people over the age of 12 in Puerto Rico and determined that the strongest means by which people are exposed to advertisements is through the television, with 84% of respondents watching TV on a daily basis. Outdoor advertisements fall in second place, with 71% of people exposed to outdoor ads on a daily basis. However Research & Research notes that Puerto Ricans spend the longest time, per day, listening to the radio -- a total of three hours and 43 minutes. This compares to the time they spend online each day, which is just one hour and 54 minutes.